Federal and state regulators descended Monday on the DMC in the wake of a Detroit News investigation. 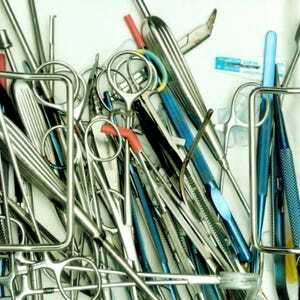 The Detroit News revealed reports of dirty, broken or missing surgical instruments at the hospitals. A team of federal and state investigators descended Monday on the Detroit Medical Center campus. DMC officials said investigation is expected to last several weeks. Federal and state regulators descended Monday on the Midtown campus of Detroit Medical Center as part of their investigation of issues with improperly cleaned surgical instruments disclosed by The Detroit News. In a statement, released late Monday, DMC said “a team of surveyors” from the Centers for Medicare and Medicaid Services and the Michigan Department of Licensing and Regulatory Affairs had begun an investigation that is expected to last several weeks. The investigation was launched after The News reported the results of a six-month investigation revealing reports that dirty, broken or missing surgical instruments have delayed or canceled surgeries for than a decade at the five hospitals located on the DMC’s Midtown campus. The News investigated more than 200 pages of emails and internal reports showing that doctors complained to DMC top officials for more than 11 years that patients were being put at risk by instrument problems, which caused surgeries to be interrupted or canceled. Federal regulators were joined by inspectors from LARA and the state Bureau of Community and Health Systems. The Joint Commission, the accrediting agency that oversees the DMC hospitals, has not been contacted as part of the investigation, spokeswoman Melanie Moss told The News in an email Monday. Accreditation is similar to a seal of approval, vouching for a hospital’s quality. At the center of the problems is the hospital’s central sterile processing department, located in the basement of Receiving Hospital, which cleans all of the surgical instruments used at Children’s Hospital of Michigan and the Receiving, Harper University, Hutzel Women’s and Heart hospitals. The News reported the system’s Midtown hospitals have been plagued with problems cleaning surgical devices, putting patients at risk for more than a decade. Improperly sterilized tools complicated operations from brain surgeries to spinal fusions, kept patients under anesthesia unnecessarily and canceled dozens of operations. Some instruments were covered with old blood or bits of bone from previous surgeries, that even when sterilized are biohazards that can trigger infection, septic shock and even death if they come into contact with patients. In one recent 17-month period, Children’s Hospital logged 186 complaints about dirty, missing or incomplete instrument sets. The likelihood that patients or their families would know that a dirty or broken instrument was involved in their surgeries is low, according to experts. There’s no requirement that a hospital or its employees reveal that dirty or broken instruments were involved in a surgery. The hospital system’s for-profit owner, Tenet Healthcare of Dallas, didn’t respond to requests for comment on the inspections Monday. Detroit Mayor Mike Duggan, who served as CEO of the DMC until he resigned in 2012 to campaign for mayor, attempted to fix the instrument situation in 2010 by consolidating three sterile processing departments serving the systems’ Midtown hospitals into one in the basement at Receiving Hospital. Duggan has refused requests from The News for an interview on the issue. In late May, the DMC signed a contract with Unity HealthTrust of Birmingham, Alabama, to take over management of sterile processing. The agreement came one day after The News first inquired about the situation. That deal, which began June 1, did not involve job losses and allows the company to recommend and implement changes. LARA officials on Friday said that agency’s investigation would include on-site inspections, but would not provide a time, adding the inspections will be unannounced. Officials said the investigation would include a multidisciplinary team of state building and health inspectors who would look at records, charts, policies and procedures. Team members also would interview patients and staff. LARA is encouraging those with concerns to contact state officials. Complaints pertinent to the investigation can be filed online at michigan.gov/lara or by phone at (800) 882-6006.